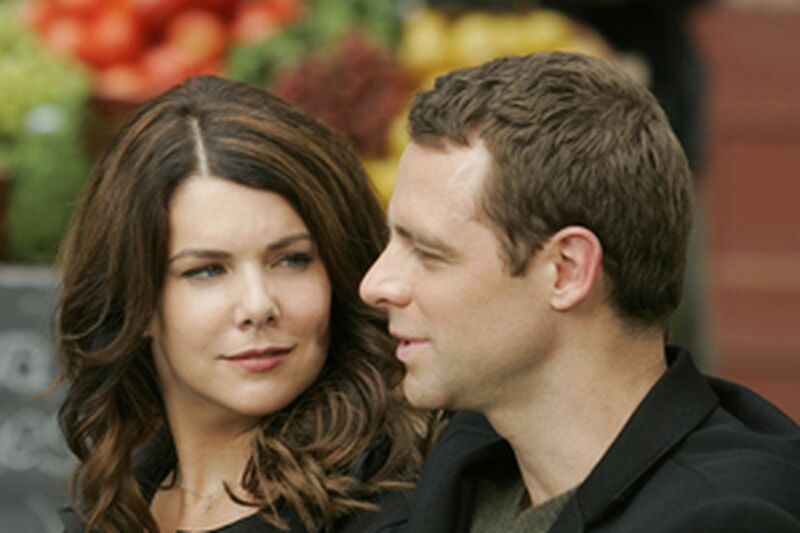 "Gilmore Girls" and its title characters, including Lauren Graham (left, with David Sutcliffe) are betraying their early promise. WITH THE fall-season announcements just weeks away, the save-our-show campaigns should be cranking up, too. If there seem to be fewer this year, that may be because some networks decided to beat the May rush, with early-renewal notices for 14 series on ABC alone. So if you're still worrying about "Men in Trees," stop. Anne Heche will be menacing Alaskan men and wildlife for another season. "30 Rock" is among the NBC shows we already know will return, Fox's "Prison Break" will stay on the run, and the CW's Nielsens-battered "Everybody Hates Chris" is still loved enough there to have been granted an early reprieve and a third season. E! Online, after polling readers for its seventh annual "Save One Show" campaign, recently agreed to lobby the CW for another season of "Gilmore Girls," which drew 2.2 million of the more than 6 million votes, followed by 1.9 million for the CW's "Veronica Mars" and 950,802 for the network's "One Tree Hill." Lots of CW fans on E! Online, I guess, because the highest-ranked major network show on its list, NBC's almost certainly doomed "Studio 60 on the Sunset Strip," drew a measly 120,312 votes. CBS' "Jericho"? NBC's "Friday Night Lights"? Not even 40,000 between them. What the E! Online vote also suggests is that it takes more than one season to win many viewers' loyalty, but that once won, that loyalty may cause fans to love their favorite shows to death. I want to save "Gilmore Girls," too, but maybe not in the way those E! Online voters have in mind. I want to put it out of its misery. I'm tired of watching the show and its title characters - Lorelai Gilmore (Lauren Graham) and her daughter, Rory (Alexis Bledel) - betray their early promise with relationship decisions that may serve the plot but contradict everything we've been told about the people involved. For me, a happy ending for "Gilmore Girls" would involve just that - an ending. I'm a little less about the tough love when it comes to "Veronica Mars," but not sure how far I'd go to "save" it, either. If keeping the show on the air means creator Rob Thomas has to abandon everyone but Veronica (Kristen Bell) and turn "VM" into yet another show about the FBI, as one scenario suggests he might, well, that's a different show, one I may or may not watch. I'm not heartless. If NBC doesn't renew "Friday Night Lights," I'm going to be plenty sad. And I'd kind of like to see how things turn out on "Jericho." But I wouldn't mind seeing term limits for some of my favorites, particularly the serialized ones. I wouldn't want "Lights," for instance, to suddenly discover a terrific college, right there in Dillon, so that the most popular Panthers and their friends could still hang out together. I'm not necessarily interested in how the nice (and not-so-nice) people of "Jericho," Kansas, will be coping in their post-nuclear society six or seven years hence. I don't think "Prison Break's" Michael Scofield (Wentworth Miller) and Lincoln Burrows (Dominic Purcell) should run forever.